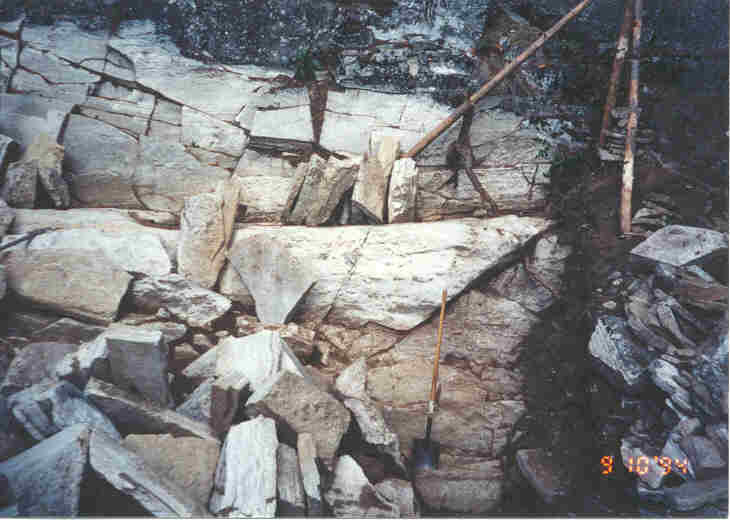 The major projects for 1994 were the excavation of the building site, to learn the shape of the bedrock on the site, and to design the building. Excavation began in the dead of winter. You can see the spade handles sticking up where the digging is going on. The dirt was wheelbarrowed down the trail you can see going down the roadway across the whole picture to the left. You can barely see the trailer and the snowshed between the trees at the upper left. Two weeks later, a lot of the snow has melted and a lot of digging progress has been made. Moving the biggest rock off the building site. The first of two rock piles is started at the left. 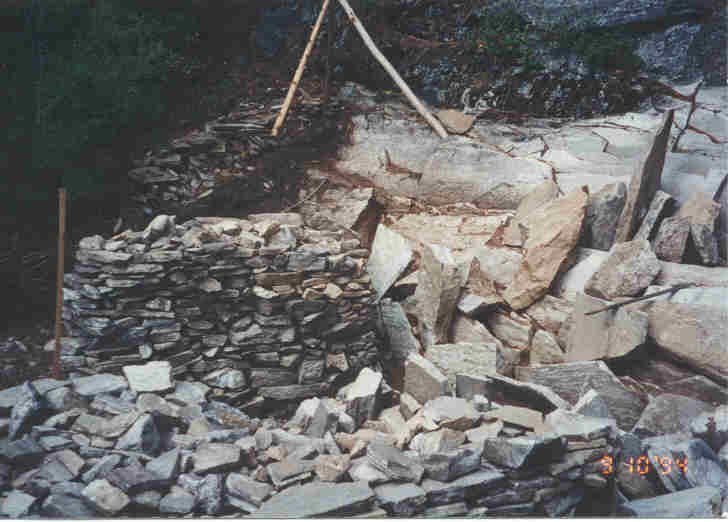 By September, the rock ledge, on which I built the northeast wall, was discovered and exposed. You can see it as the horizontal line just above the center of the picture. 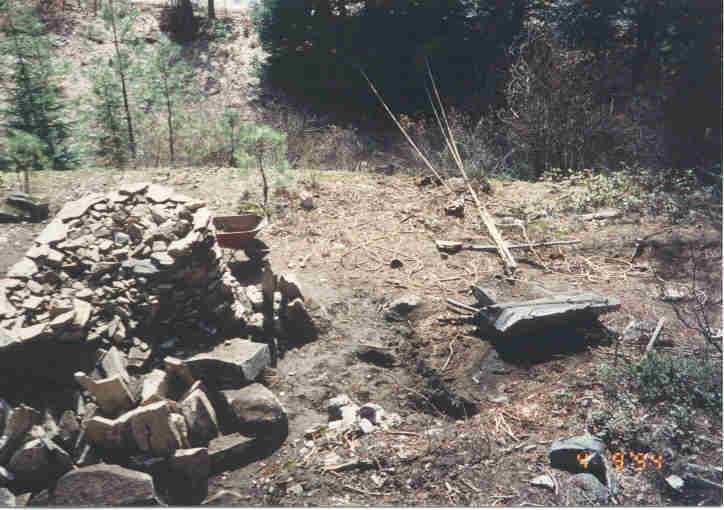 You can see some rocks I stacked on the ledge planning to use them in the foundation. The tripod at the right will be the batterboard for the east corner of the building. The line separating the white colored rocks from the dark ones shows where I have excavated. This picture looks to the left of where the previous picture left off. You can see the rock ledge at the center of the right quarter of the picture. The tripod at the top center is where the north corner of the building will be. You can see the top of the first rock pile in the foreground and the second rock pile in the middle of the left half of the picture. 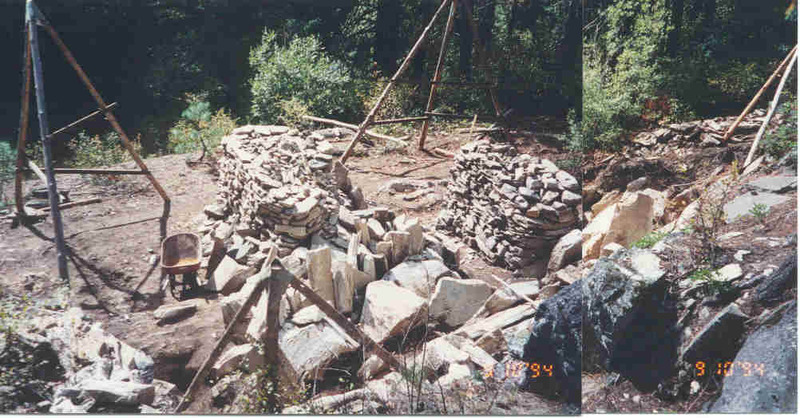 The rocks that were too big to lift onto the rock piles are stacked all around, including on top of the ledge. You can see the excavation line again up against the cliff in the background. This picture shows the building site looking down from the cliff behind it. You can also see the edge of the cliff in front of it. The four corner tripods are in place that will hold the batterboards. Excavation is pretty much complete. 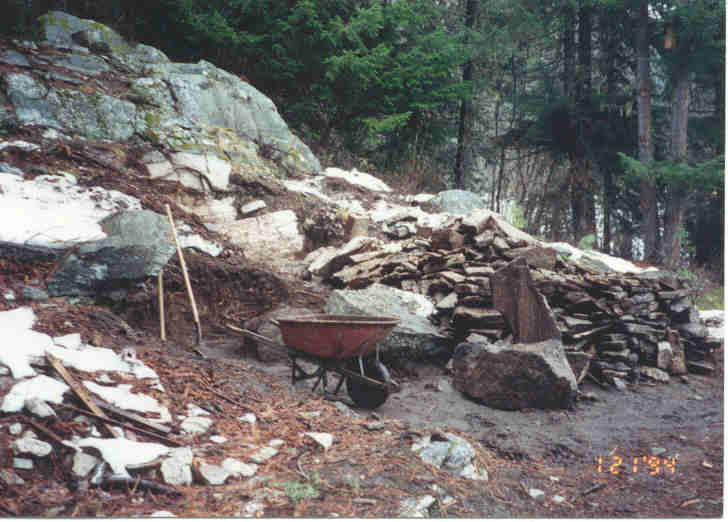 The rocks are stockpiled inside the building site with the intention of using them to build a rock foundation. You may need to scroll to the right to see the whole picture. 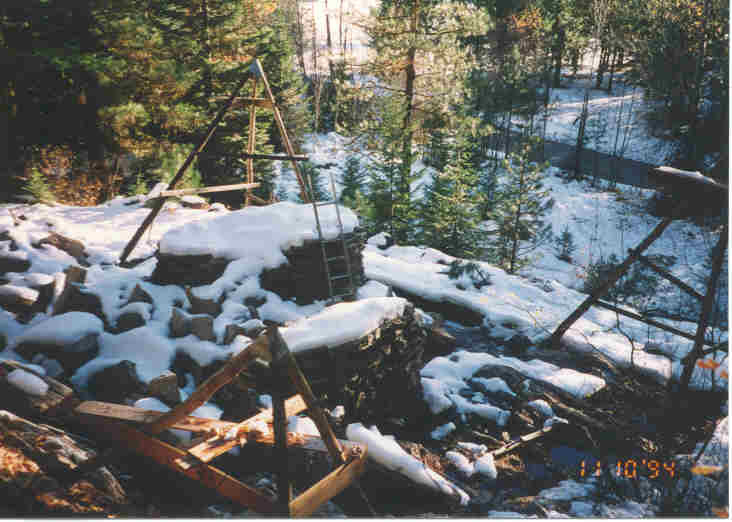 By November, the foundation trench had been dug down to solid bedrock. You can see part of the trench running from the very center of the picture diagonally down to the right along the base of the tripod at the rignt. The tripod at the right is the west corner, the one in the foreground is the north corner, and the one at the upper left is the south corner. You can see the white river road at the upper right. This picture was taken from the High Rock on the cliff behind the site. 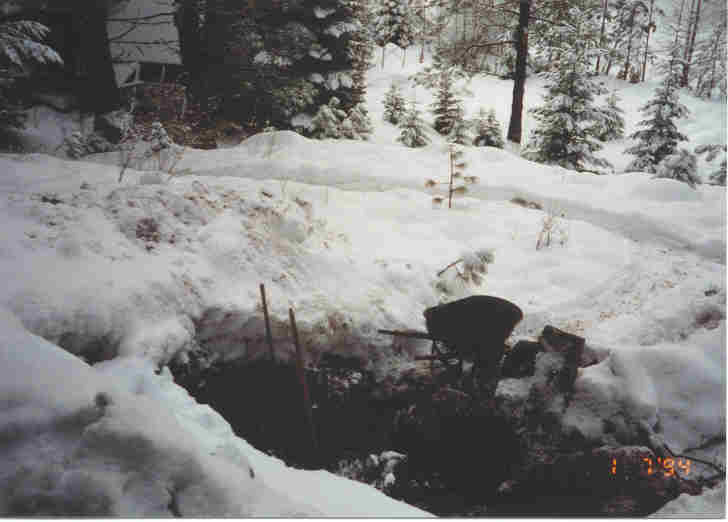 Snow began to pile up in December. 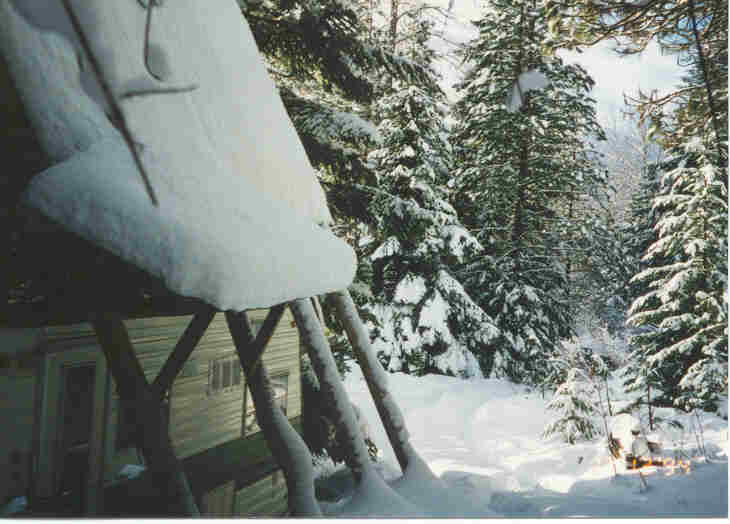 The new porch roof on the snowshed kept the doorway and entrance free of snow.